Nasa's Hubble Space Telescope (HST) has captured its deepest view of the Universe, producing images of galaxies that have never been seen before. The pictures were acquired by the HST's new Wide Field Camera 3 (WFC3). This highly sensitive camera can see starlight from far-off objects - light that has been "stretched" by the expanding Universe. Scientists who have analysed the new images say the galaxies they reveal could be the most distant yet observed. Two UK-based teams of scientists published their analyses in the Monthly Notices of the Royal Astronomy Society. 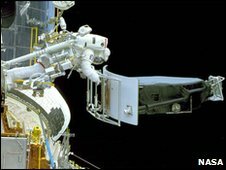 WFC3 was added to Hubble as part of a upgrade and repair mission carried out by the space shuttle Atlantis earlier this year. The camera is sensitive to infrared light, which has wavelengths about twice as long as visible light and cannot be detected by the human eye. It is described as "beyond red". Dr Andrew Bunker, an astronomer from Oxford University, led one of the teams that studied the new pictures. He explained that the camera had captured "light that started its life in the visible and has been stretched to longer wavelengths, so it is redder". 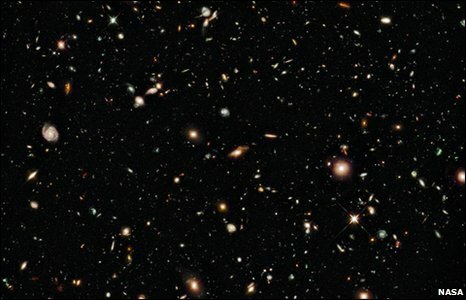 Some of the new images are from the region of sky known as the Hubble Ultra Deep Field. Dr Bunker and his colleagues first analysed this five years ago using Hubble's Advanced Camera for Surveys (ACS). "We're able to use this new data - taken at long wavelengths - and combine it with the existing data that was taken in the visible [spectrum]," he told BBC News. "We make a colour image with the long wavelengths and the short wavelengths and look for a very distinctive signature." That signature is based on colour. The redder an object appears, the more its light has been stretched, and the further away it is. Capturing this stretched starlight gives astronomers a glimpse back in time to the early Universe. Dr Daniel Stark, a postdoctoral researcher at the Institute of Astronomy in Cambridge, also worked with the teams reporting their work on Tuesday. He said: "We can now look even further back in time, identifying galaxies when the Universe was only 5% of its current age - within one billion years of the Big Bang." But Dr Bunker said that the exact distance to the galaxies was yet to be confirmed. "The evidence on the basis of the images - the colours - is very strong," he told BBC News. "These are some of the most distant, and perhaps the most galaxies distant yet seen." But to confirm this, he said, astronomers would need to study the spectrum of light from each galaxy, to measure its "redshift". This is a measurement of how much the light from a distant object has been stretched. Professor Jim Dunlop from the University of Edinburgh co-led a team with Dr Ross McLure, which also studied the Hubble data. 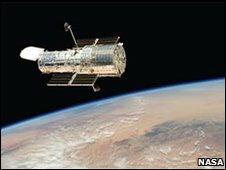 He said: "These new observations are likely to be the most sensitive images Hubble will ever take." The follow-up studies, he added, would be possible when Hubble's successor, the James Webb Space Telescope (JWST), was launched in 2014. Dr Bunker described the JWST as the "next quantum leap in telescope technology". "It has a greater collecting area and is optimised to work in the infrared," he explained. "With JWST, we'll be able to take the spectra of many objects at once... This will be wonderful - instead of [analysing] the odd galaxy, we'll be able to build up meaningful samples and do real science." 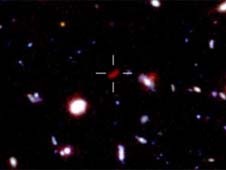 In 2007, a group led by Professor Richard Ellis from the California Institute of Technology reported the discovery of light from galaxies at similar, and perhaps even longer, distances than the ones reported on Tuesday. He and his team employed a technique called gravitational lensing, which uses of the gravity of relatively nearby objects to magnify the light coming from much more distant objects. Dr Bunker, who has worked with Professor Ellis's team in the past, explained that the scientific community was still actively studying the Caltech team's "very exciting" results. "The galaxies they looked at were really incredibly faint," he said. "And they looked at the glow of gas, which is the very limit of what is feasible and difficult for the community to confirm." He said that he expected Professor Ellis's results eventually to be confirmed and said that all the studies were "complementary". "They show us the different aspects of galaxy formation."